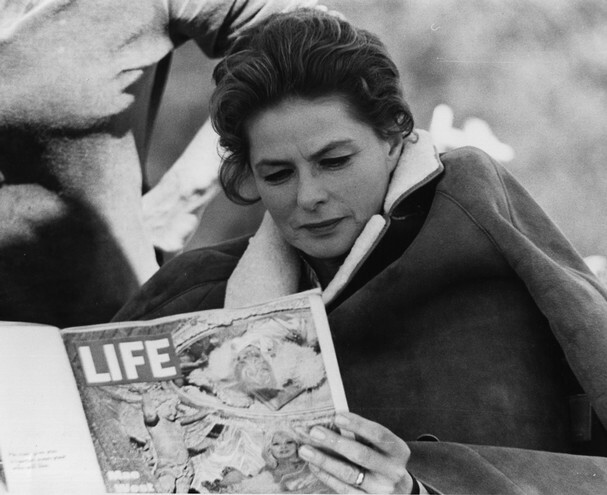 Ingrid Bergman died three years before I was born. The only summer I worked at camp, “Bergie” was my camp name, and whenever I was asked about it I had to explain who Ingrid Bergman was, to gaggles of pre-teens who were more interested in Jonathan Taylor Thomas and Heath Ledger. Sometime during eighth grade I began acting like the adolescent Ingrid I was reading about in Donald Spoto’s biography—meaning, I pretended I could act. That year, I almost enrolled in German instead of French, because it was her mother’s native language. My first email address was just the consonants in her name, at aol.com, a series of letters I could rattle off, omitting the vowels as if they were my own. I begged my father to tell me how “Casablanca” ended but he resolutely refused, and then he took me to see it on the big screen at the art house downtown. When I watched it again most recently I was stunned to realize how many of Ilse Lund’s patter is ingrained in my speech. I have always wanted to be five-feet-nine-and-a-half inches tall. I have always wanted to have long, thin thighs. I have always wanted a longer, thinner nose. I have always wanted to tilt my head and smirk with some kind of secret Swedish generosity. I signed up for my first museum internship in part because it was run by the Swedish Historical Society in my home town. I recorded her scenes in “Cactus Flower” using the tape deck that was hooked up to the VCR in our basement, so that I could memorize her inflection in her character’s sarcastic comebacks. It was like learning a language phonetically, without learning the vocabulary words. I was in my twenties before I learned what “hung one on” meant. I recognize Ingrid Bergman’s face in nearly the same way I recognize my grandmothers’ faces. She is my ancestor. When I started a new job this week I went in search of a cactus to place on my desk, just like her character in “Cactus Flower.” I have done this at every job at which I’ve had my own desk. Whenever my cactus shoots off a little flower, I want to exclaim, “My cactus! It’s blooming!” In my head, I can hear her giggle, marveling at the way life blossoms.